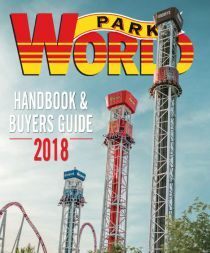 Since this summer’s announcement that Pittsburgh’s iconic Kennywood Park will open the groundbreaking Steelers Country attraction in 2019, football and roller coaster fans have been eager for news on one of the most exciting projects in recent amusement industry history. 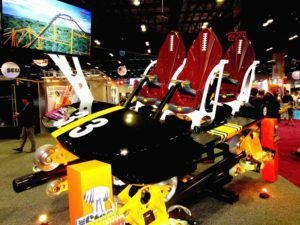 During the recent IAAPA Attractions Expo, S&S Worldwide and Kennywood came together to reveal one of the most exciting aspects of Steelers Country’s star player, showcasing the ride vehicles for the Steel Curtain roller coaster for the first time. Matching the colors of the track and structure of the coaster, the vehicle features the iconic black and gold colours of the Pittsburgh Steeler uniform complete with number 33 on the center of the lead vehicle, a nod to the year the sports franchise was founded (1933). The vehicle’s sleek, comfortable seats are themed and shaped to look like footballs with the laces facing outward. The restraints on the vehicle are lap bar only (no over the shoulder restraint), and guests will notice just how open the vehicle is as the train twists, turns and inverts them smoothly at high speed. The towering Steel Curtain roller coaster will rule Kennywood’s skyline. With a record-breaking nine inversions (most in the Western Hemisphere), 197 foot (60 m) tall inversion, and 220 foot (67 m) maximum height, Steel Curtain is an adrenaline rush like no other, speeding across 4,000 feet (1,219 m) of track at 75 mph (121 kph). 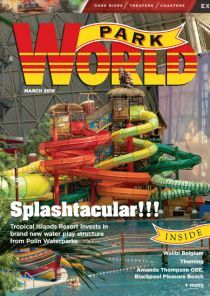 Designed by S&S Worldwide, Steel Curtain will break a Pennsylvania record, a North American record, and a world record. The colossal steel structure of the coaster will serve as a landmark addition to the park and a high-energy entry point welcoming guests to Steelers Country. Ground has already been broken on the Steel Curtain, with the first pieces of the ride being erected this month. Crews will be hard at work to open Steelers Country, highlighted by this record-setting roller coaster, during the 2019 season.